There are many consequences to the bursting of the US real estate bubble that will likely require years to unravel, but at the root of the growing global economic crisis is the present oversupply of homes for sale in the US. We can end that supply glut now and begin recovery today. During the first half of this decade, low interest rates and a lack of regulation in the US fueled record demand for homes, pushing prices higher and higher. But when interest rates began to rise in 2005, buying slowed and so speculators rushed to sell as prices began to drop. Soon there were far more homes for sale than there were buyers. Today there are about 3.6 million homes for sale in the US, which is about two million more than a healthy 3-4 month supply. Thus, sellers are usually forced to drastically reduce their prices when circumstances dictate they must sell within a few months. But with prices dropping, most buyers must wait for the market to find a bottom that permits a safe mortgage, and so the demand falls faster still. The consequence is a spiraling decline of home prices, and last year we passed the tipping point on that collapse, as the number of month's supply skyrocketed by more than a third, more than twice as fast as the inventory grew, while prices fell at a record pace. With supply high and demand low, new home construction has nearly stopped, idling one of the largest industries in America. 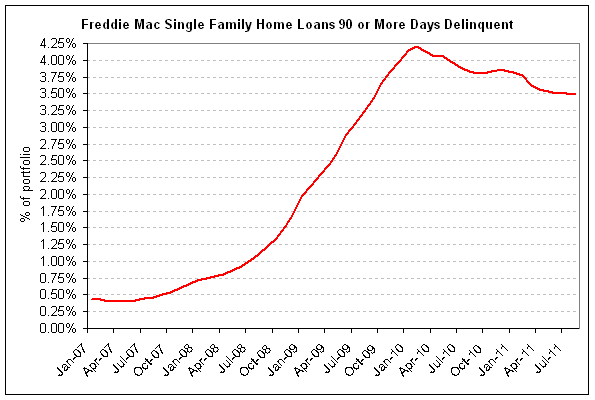 And with home values falling below mortgage debt, many homeowners are pushed into default on payments. The damage from falling employment and increasing mortgage defaults and consequent foreclosures is cascading through the global marketplace. Just one year ago, on March 11, 2008, the problem suddenly escalated as banks stopped lending money to Bear Stearns because too many of the mortgages that Bear Stearns used as collateral were in default. Then, last September, Lehman Brothers, one of the worlds largest investment banks, was forced into bankruptcy for the same reason, triggering an acute crisis because lenders around the globe were unable to discern who held that bank's bad debt. And now, AIG, the world's largest insurer, is failing because it insures the mortgage-based collateral. To date, $11.6 trillion have been lent, spent, or guaranteed to bail out those affected by the crisis, but not one penny has been spent on fixing the leak. Follow the money: "Credit default swaps" are the insurance we're bailing out for "mortgage-backed securities". These are the "derivatives" that dwarf the value of the mortgages on which they are based and that are tanking because mortgages are defaulting...because home prices are collapsing...because of a glut of properties dumped on the market. So it's the oversupply of houses for sale that is the leak. So why bail trillions of damage rather than fix the leak for hundreds of billions? Until recently, home prices were still too high, so that purchasing any home - much less two million homes - risked taking a substantial loss. But the median national selling price is now $165,000 (down 28% from the 2006 high, and down last month 3%) when we include the 45% of purchases that were foreclosed properties sold at substantially reduced prices. That's a good price when measured by median household income and long-term price trends. So purchasing the two million excess homes - if we include the approximately 800,000 currently in foreclosure - carries a price tag of $330 billion - a good and fair price and only about 3% of the bailout money committed thus far. The closest the US government strategy comes to addressing the leak is the $75 billion Making Home Affordable plan that is aimed at helping "homeowners suffering from falling prices". But why not stop the fall entirely rather than try to catch a fraction of the victims? There was a time when median home prices were so high and the number of homes on the market was growing so quickly that buying the excess was perhaps something not worth considering, but now the median price is good and the glut has been stable for months. So why not begin recovery today rather than watch trillions more in equity vanish? Purchasing the excess inventory would define a bottom to the market because demand would then match supply, so simply committing to the purchase would permit banks to resume writing and refinancing mortgages. And renewed demand would send the construction industry back to work building new homes, while rising home prices would end mortgage defaults and so begin a broader economic recovery. The two million homes could be resold for a profit over several years that would probably cover all expenses, and meanwhile the large reserve would forestall another round of speculation. Everybody wins - the sellers, the buyers, the workers, the lenders, all the businesses downstream, and the taxpayers. So why doesn't the US take those properties off the market since the derivatives are multiplying the mortgage losses exponentially? Could it be that the blank check for government agendas and windfalls for wealthy bankers et al are just too seductive? Indeed, these "bailouts" for the wealthiest might be the price for finally moving forward with a truly progressive agenda. And perhaps in part it's just human nature: On the top deck you feel the icy water climbing your shins, not the leak drowning the passengers in steerage. But if we don't stop this leak by correcting the housing supply then the global economy will continue to sink, and there might be very little left in the end to fund any agenda.